Welcome to another 'Gaga for...' post! Sorry I've been spamming y'all 3 days in a row- that won't typically happen but this whole week's schedule has been messed up! This week I decided to be mega specific and talk about not only my love affair with novelty/actual animals in prints...but flamingos in particular! I'm a huge sucker for them and I believe I got it from my mom as they're one of her favorite prints and/or collectibles too! Basically anytime a dress, skirt, shirt, whatever comes out in a flamingo print you can bet that I'm either purchasing it as we speak or stalking it on a wish list hourly! Plus, summer is winding down so I thought it'd be a fun way to bid adieu to such a fun and summer-y novelty print (though chances are I will rock flamingos at some point this winter!). I discovered this Sunny Girl dress on Modcloth when it had already sold out and that made me sad. But then it got returned in my size and was reduced even further and I got it so that made me happy! It's a heavier material and is lined so I consider it better for spring and fall-and on an overcast summer day at one of my best friend's pool like in the above picture! When I visited my best friends from college this past May in Miami, I naturally had to bring it as when you think Miami flamingos seem to come to mind. With one of my most favorite people of all time...right about the place we met so many years ago! 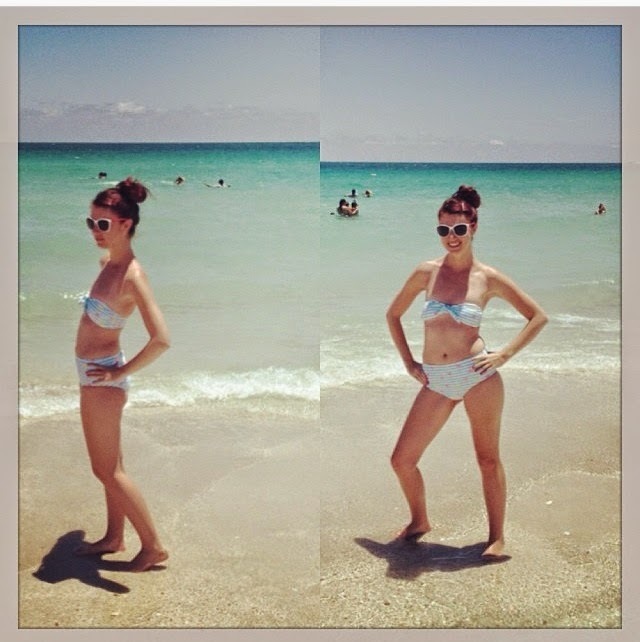 I also have a swimsuit with flamingo prints, so naturally I had to wear that too well out and about on South Beach. I love this flamingo shirt (above) because it reminds me of a sunset. On one Sunday Funday afternoon with one of my favorite people this past spring I paired it with my merlot skirt to bring out the contrast. I brought my Melie Bianco bag that matched the closest and paired it with gold or orange accessories. Finding this bus was an accident and while some may say it clashes with the merlot, I say oh-well as I was already working with all the shades of gray for the red-orange-pink-purple spectrum. Also, getting my Border Collie to look into the camera is nearly impossible so it's hard not to love this pic! One of my favorite flamingo finds was this crop top from Forever 21. I next to never shop there anymore but when I need basic tanks, tees, and crop tops I tend to stop by there because I don't wanna spend $20 on a such a small piece of clothing if I can find it for under $10. Usually the more interesting prints there get picked over pretty quickly (at least in my size) so I was thrilled to find a flamingo print in my size! (For more about how to wear crop tops with longer length skirts click here). 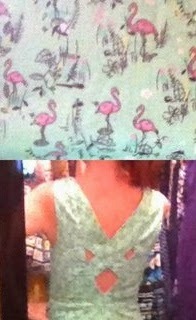 But this next dress probably takes the cake for my all-time favorite flamingo print to date! Yay, that's so awesome you finally got the Hell Bunny flamingo dress! Love all your flamingo stuff :) Flamingos are just so darn cute. My flamingo dress is one of my very favourite pieces. Not surprised you understand the obsession!! Lol. Flamingos rule! You can never beat flamingo prints...they're awesome! !